“Because you don’t notice the light without a bit of shadow. Everything has both dark and light. in contrast to the immensity of life. and with the creaturely world around us. and there is purpose for it. that are but drops in an ocean. Cease focusing on your droplets of water and look around you. A garden built from woody trunks, stems, branches and beautiful leaves will last through the seasons. Abundant foliage offers cool shade and privacy. It screens the view, cleans the air, muffles outside sounds and protects the soil, all while offering a sense of enclosure. Flowers can be exciting, for a while. But they fade or explode into a heap of petals all too quickly. Their perfumes entice us, but flowers aren’t enough to create a lasting garden. Better to focus on foliage plants for a garden’s flesh and bones, and appreciate ephemeral flowers as seasonal accents. Once one gets past wanting a garden filled with fragrant flowers, there is a beautiful palette of foliage waiting for the curious garden designer. 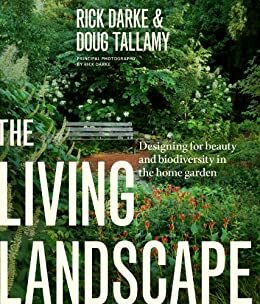 In fact, I’ve been reading an intriguing book on garden design by Karen Chapman and Christina Salwitz called Gardening With Foliage First: 127 Dazzling Combinations That Pair the Beauty of Leaves With Flowers, Bark, Berries and More. The authors have photographed and described associations of shrubs, perennials, vines, ferns and grasses that will grow well together for a variety of climate zones and locations. The color combinations are striking, and the authors discuss how the association will change as the four seasons unfold. One of the nicest things about designing with foliage is the wide selection of colors and textures in the plant palette. And with woodies and perennials, the plants grow larger and more complex with each passing year. A native redbud tree seedling has appeared by our drive. This tree can eventually grow to 20′ or more. We plan and plant our gardens in at least four dimensions. We create out door ‘rooms’ by creating ‘walls’ with large shrubs and trees, or perhaps vines growing on a pergola or trellis. Our carpet is a selection of low-growing plants and ground covers. Some of us cultivate a simple carpet of moss. The leafy canopy of trees offers us a bit of shelter and shade, enclosing our garden from above. So we are planting foliage plants of varying heights to serve different purposes. Red Buckeye, Aesculus pavia, is a native, deciduous tree in coastal Virginia that will grow to about 25 feet. It often grows as a multi-stemmed shrub, growing a bit broader with each passing year. Perennials tend to also spread, growing wider with each passing year. A plant or two this year may propagate itself into two dozen plants within just a season or two. Even within the short span of a single season, a small tropical plant purchased in a 3″ pot may grow to be 5′ tall and wide before frost. Our garden is also constantly changing over time, the fourth dimension. Sculptural stems and branches cover themselves in buds, then ever expanding leaves. The leaves grow and change colors as the season progresses, often developing intricate veins or spotted markings as they mature. Eventually, we are enclosed in leaves and woody growth before winter sweeps the season’s tender growth away. Leaves glow with autumn color, then fall. Perennials die back to ground level, harboring the promise of next year’s growth in their roots and crowns. It is this foliage framework which demands a garden designer’s attention. This is where we make our main investment of time and treasure. When beginning a new garden, one selects and plants the trees first to give a head start on growth. When renovating a garden, it is wise to replace tired shrubs, or rejuvenate them with heavy pruning before the season’s new growth begins. Once we have good woody ‘bones’ in place, then we fill in the ground covers and herbaceous plants to occupy the mid-level spaces . Flowers are the ephemeral elements which can come- and go- with the seasons. Whether we choose blooming shrubs, perennials with a short season of bloom like Iris, or even if we plant annuals for several months of bloom; the flowers themselves are very short-lived. Japanese painted fern emerges among the Arum italicum, and is interlaced with creeping Jenny. Bulb foliage will die back soon. You can just see the new leaf of a hardy Begonia catching sunlight like a stained glass window to the right. They will grow to about 18″ tall before their tiny pink flowers emerge. Many traditional gardens rely on foliage for all of their seasonal interest. This is easy to do with herbaceous perennial foliage plants like ferns, Heucheras and Colocasia. But a ‘foliage only’ garden doesn’t mean a monochromatic garden. Beautiful contrasts and color combinations may be painted with colorful leaves. And stunning beauty may be created with little more than variations of texture and form. Leafy plants swaying in the breeze bring life and movement to the garden. Lamb’s Ears, Stachys Byzantina. is grown more for its velvety gray leaves than for its flowers. In fact, many gardeners remove the flower stalks before they can bloom. Bees love it, so I leave them. As you plan and plant your pots and garden borders, remember to focus first on the foliage framework. This will last over many months or years and will grow better with time. The flowers will come and go, but your garden’s leafy presence will make the lasting impression.